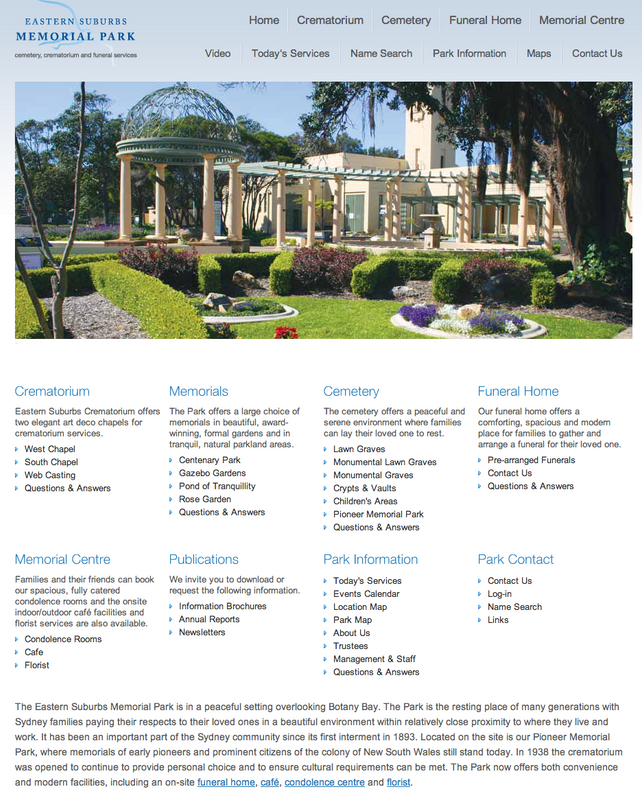 Estern Suburbs Memorial Park Cemetery & Crematorium (ESMP) launched their new site a white ago. At the time I was both busy and waiting to see what other changes might be made. But ait is now about time I discussed the new site. As it is well worth discussing and a great step in the right direction. Overall I think this new ESMP site the the best site for any Sydney cemetery or crematorium. In so many ways it does so well. And I suspect it is not even fully finished yet. It is a site well worth discussing as I think the mentality behind it is wonderful and hope it works out. The site is clean, simple and nice. I like the history part at the bottom. A great thing about the site is how easy it is to use. Take the maps section as an example, this is one click away from the homepage, easy to find on the site and has nice maps to download. The "location" section under "park information" is also well done, using a google map and keeping it simple. Hands down the best thing about the site is how well it explains ESMP. One could quite easily use the new ESMP website to get a feel for the place and the company. Because the site does a good job of not only explaining the things offered, but also showing what the place is like. Giving the user a feel, an atmosphere for ESMP. Things are described in an emotional way and photos of the place accompany most pages. So one gets an emotional description for how it feels while being able to see examples of what it looks like. Take the crematorium pages as an example. They accurately describe each chapel, how they are different and what is offered at each. But they also describe the feel of the chapels. The West Chapels is talked of as "popular for smaller, intimate, gatherings" which sets the tone of this chapel. The rest of the information goes on the briefly describe the AudioVisual system. But the important part, the thing which separates it from others, is the description of how it feels. To describe this chapel as small and "intimate" immediately individualises it not only from the other ESMP chapel, but from other crematoriums. The West Chapel now has its own unique identity and feeling. Having a floor plan on the brochures for each chapel is also a great idea. In just a few minutes one can get a decent and accurate feeling for these chapels. Which makes them and ESMP stand out and friendly to those unfamiliar with the industry. Most funeral companies focus heavily on grief, mourning, remembrance, and so on. It is something I dislike as so much emphasis is placed on these aspects that the company itself is lost. One does not go to a crematorium website to learn about grief. And yet that is all one can learn with certain crematoriums. Thankfully this is not the case with ESMP and is best seen through the cemetery and Q&A pages. The cemetery page very briefly discusses the "award winning gardens", talks of the cultural variety and the different choices offered. Yet it only talks of remembering deceased once at the very start. Clearly the emphasis is not on grief and mourning but on ESMP, as in what it is like and offers. 1. How to personalise a funeral and make a special tribute for a loved one? 2. What is the role and responsibility of the person who fills out the paper work for a funeral? 3. How to select a funeral director? 4. How to leave a message for your funeral director to call back? 5. How much does it cost for a funeral? 6. What is a pre-paid Funeral Plan? 7. What items need to be located and compiled when someone dies? 8. How important is having a current Will? 9. What is the best way to choose a coffin? 10. What are the different types of coffins and caskets? 11. What are the different types of coffin accessories and how are they used? 12. How important is the use of music and videos? 13. Is it popular to place photographs and memorabilia on the coffin? 14. How are flowers used in a funeral? 15. How to prepare a Eulogy? 16. How to organise a Wake? 17. Is cremation a substitute for a funeral? 18. Arranging a service for a cremation? 19. How to decide whether to be buried or cremated? 20. Important information relating to organ donation. 21. What is embalming and when is it done? 22. How long can a body be kept prior to a funeral? 23. What are the design features of a Hearse? 24. What are the road rules and etiquette when approaching a cortege? 25. What happens when someone dies overseas? 26. What happens when someone dies interstate? 27. How are services for Returned Soldiers and Ex-Servicemen and Women conducted? While most sites have questions on "how to deal with grief" or "managing loss" ESMP has taken a very different approach. The questions explain the funeral, from coffin accessories to cortege road rules and even the importance of music. Things mourners would like to know and find interesting or useful. These are the questions people email me, and the ones most funeral companies overlook. Out of all the Q&A sections there is only one question on Grieving the loss of a loved one. The answer is decent, but short in comparison to many others. But that is fine, and I think a good thing. I highly doubt many mourners (if any) are going to funeral company sites to look for how to deal with grief or mourning. Unfortunately many funeral companies focus on this, and while they talk about it few ever do so properly. It is treated as a side thing, as though it is a necessary addition to their site. So while these companies spend a lot of space on these topics they rarely have an in-depth or useful discussion. There is a serious lack of quality information on grief and mourning. But I would be surprised to find people turning to funeral company websites for this. Not the sites about the company itself that is. Other things like HeavensAddress and specialist websites are a better option for this. In the mean time it is very refreshing to see ESMP buck the trend. To see it accurately describe itself and not only explain the things on offer but convey an atmosphere and feeling for ESMP The ESMP site is not perfect, but it does everything I have said and thought a funeral company site should. ESMP have put together a nice and simple site that focuses on ESMP in a good way. When talking with the ESMP staff at the open day I wondered about the future of ESMP How progressive they were and how ESMP might start to 'steal' the crematorium/cemetery discourse. So I suspect this is just the first step in a long and interesting road for ESMP I know I will be keeping a close eye in on the place and focus on it more in future research.